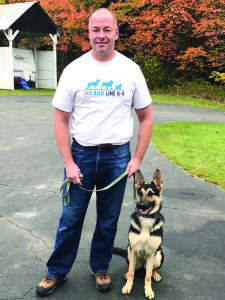 Tom Radford, owner of Thin Blue Line K-9, with business partner Kayleigh. Tom Radford is retired from police work, but he’s a rookie again as a business owner. Radford is translating the dog training skills he honed as the head of the Burlington Police Department’s K9 unit into a Williston-based dog obedience school focused on house calls – Thin Blue Line K-9. Radford is also actively looking for rural property in Williston where he envisions a dog training academy with indoor group classes and outdoor trainings that mimic the tracking and searching exercises he taught as an instructor at the Vermont Police Academy. “I’m going to implement what I know as a police dog trainer into the public sector,” he said. “It’s stuff that excites and challenges the dog, expends their energy and makes for a unique, diverse training. It’s also fun for the human. For now though, with Thin Blue Line K-9 just a few months old, Radford is focused on working in the home of the dog and owner, where problems like aggression, jumping and leash-pulling are most effectively addressed. German shepherds are the iconic police dog, and Radford worked with one named Stoney for eight years. Together they set a record for most drug finds on duty, according to the Vermont Police K-9 Association, and have been inducted into the association’s hall of fame. Radford also worked with Belgian Malinois, Dobermans and Labrador retrievers as a police dog trainer. He recently became the owner of a 9-month old German shepherd named Kayleigh, whom he calls “my business partner.” She is being trained to be a role model for client dogs. “It doesn’t matter what size or breed the dog is, the information I’ve learned from all my years at the (police) academy transfers over to any breed and any size dog,” Radford said. Thin Blue Line K-9 offers several packages of sessions, as well as one-time consultations and review of biting incidents. As any watcher of “The Dog Whisperer”: — the popular dog training reality TV show featuring Cesar Milan — knows, teaching a dog’s owner how to be a positive leader for a dog is the only way to create lasting change. That is Radford’s approach. “My job is to teach the human to train the dog,” he said.